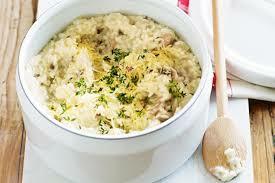 Loving Oven Baked Chicken Risotto in Winter! I love Risotto, especially this Oven Baked Chicken Risotto. Unfortunately not many others in this household share my love of this tasty dish. This is an oven baked version, therefore I don’t have to stand over the frying pan and stir, stir, stir. It’s quite easy to prepare and you can change things up to suit what you have in the fridge, so it’s a great way to get rid of leftover bits of vegetables. It’s also a good way to get vegies into the kids too. I found this recipe only recently as I couldn’t find any of my old recipes, it is almost the same though. I really have to sort those recipes out soon and start posting. Enjoy! Preheat oven to 180°C/160°C fan-forced oven. Heat oil in a large flameproof, ovenproof dish over medium heat. Cook onion and bacon for 2 minutes stirring until softened then add in chicken and mushrooms and saute until chicken is browned for approx 5 mins. Add rice. Cook, stirring, for 1 minute. Add stock to rice. Stir well to combine. Cover. Bake, covered, for 15 minutes. Fold through zucchini and peas. Return to oven and bake, covered, for a further 25 minutes or until rice is just tender and liquid has almost all absorbed. Stir in parsley and parmesan. Season with pepper. Serve. Pumpkin and pea risotto is one of my favorite combinations as is salmon with macadamia nuts. Just experiment! Can be reheated for use the next day. Finely grate extra vegetables to increase vegetable intake for children. An easy to reheat work lunch. Did you notice that there was no wine in this risotto recipe? You can add some if you like otherwise it tastes fine without it.